Note: For an authentic blend, some folks insist that you use a sprig or two of dried lavender. However, this is one of those ingredients that you either love or hate, so I've left it out for this recipe. If you'd like to use it, simply add a chopped teaspoon or two and combine with the other ingredients. Add the herbs to a bowl and combine. That's all there is to it! Store in an airtight container in a cool place and out of direct sunlight. Use within 2 months before making a fresh amount. Note 2: it's a good idea to crumble the herbs between your fingertips when adding to your cooking. This will help release the herbs essential oils and therefore more of their flavours. 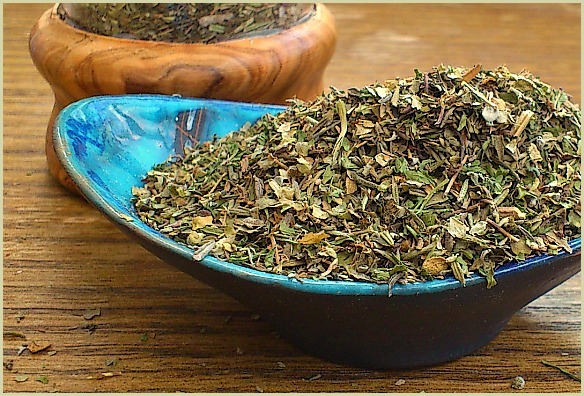 And, if you have one available, a herb grinder is also a useful piece of equipment for herby blends like this.